When you’re watching cooking shows on TV, you’ll have a tendency to crave not only for the food they’re preparing but also for the latest kitchen cookware they used. But to tell you, most expensive and chef-endorsed cookware sets may not be great for you, you have to think twice before buying a full line. Stainless steel cookware is one of the most popular cookware in the market and known for its excellent durability that could literally last forever, stylish design, and versatility. Most of the professional chefs and cooks recommend stainless steel cookware primarily because it is easy to maintain and you can prepare any type of dishes in the stainless steel pans and pots. In this article, rather than recommending brands, I will share you some useful information you can use to help you in your purchasing decision about the most health-supportive stainless steel cookware on the market. What are the other different types of cookware? How clean and maintain stainless steel cookware? What are the things to consider before purchasing stainless steel cookware? Before anything else, let’s take a little look at the history of stainless steel and what exactly is it. ​​​​​​​​Probably you didn’t know that stainless steel was first discovered by a British metallurgist Harry Brearley in 1913 and used as a strong material for building weapons during the war. Maybe you used to think Stainless steel was just another element such as aluminum, carbon, oxygen, hydrogen, etcetera, surprisingly, it is not. Steel is a mixture (alloy) of iron and 1.7% carbon weight. It has been known to have stronger durability than plain iron but it can be prone to corrosion and rust. So that’s how stainless steel plays. Stainless steel is a form of an alloy with the combination of steel but added with 10.5% of chromium by weight and other elements such as nickel, nitrogen, molybdenum, titanium etc. Higher corrosion and rust resistance means higher chromium content. There are wide-range of stainless steel formulation, but we will only focus on one – the food grade stainless steel. The list goes on with Stainless steel, it is almost available everywhere, from weapons, building constructions, flatware, appliances, implants to of course cookware. Stainless steel used for crafting Food equipment must be a type in the 200, 300, or 400 series, according to the NSF International Standard for Food Equipment Material. What does the series mean? Let’s take a look. It is considered as cheap, food grade, and safe stainless steel, the 200 series replace the nickel content with manganese which is much cheaper. It is also known as an ‘austenitic’ type and non-magnetic type of stainless steel. However, it might not be great for long-term use because of its low quality. This subcategory of 300 series food grade stainless steel is the most common types of material used in cookware especially the 18/10 and 18/8 which is a form part of the 304 series which is known as an ‘austenitic’ type and non-magnetic type of stainless steel. Maybe you’re wondering about the numbers stamped on your stainless steel cookware, this is how it works. For example, you might see an ‘18/10’ stamped on your cookware, that means the first number is the amount of chromium while the second one is the amount of nickel used in the cookware. So 18% of chromium and 10% of nickel. This grade of stainless steel contains a small molybdenum content which contributes to its excellent durability and high-end feature. It’s basically made up of 16-18% of chromium, 10-14% of nickel with 2% molybdenum or titanium. The 316 stainless steel grade is less common than the 304 stainless steel, it offers high-level of rust and corrosion resistance but it might be quite pricey. This type of stainless steel grade is also called marine stainless steel due to its high rust and corrosion resistance on extreme saltwater erosion and surgical stainless steel for biomedical implants as well. There is no difference between the 316 surgical stainless steel and 304 stainless steel grade for cooking. A good quality 304 stainless steel cookware set will do just fine. The 400 series also known a ‘ferritic’ and magnetic type of stainless steel is used mainly for mixing bowls, cheap stock pots, and flatware and it comes with 18/0 which means 18% of chromium and 0% nickel content. 0% nickel can be great for some people with allergies however, this could also mean that it has low rust and resistance or maybe not durable as the other food grade stainless steel. Choosing the best cookware that suits your cooking technique is important. Here is the list of types of cookware ordered based on its popularity. Stainless steel as mentioned earlier is one of the most common materials used for cookware, uncoated stainless steel offers a long-lasting and classic choice for braising and browning. 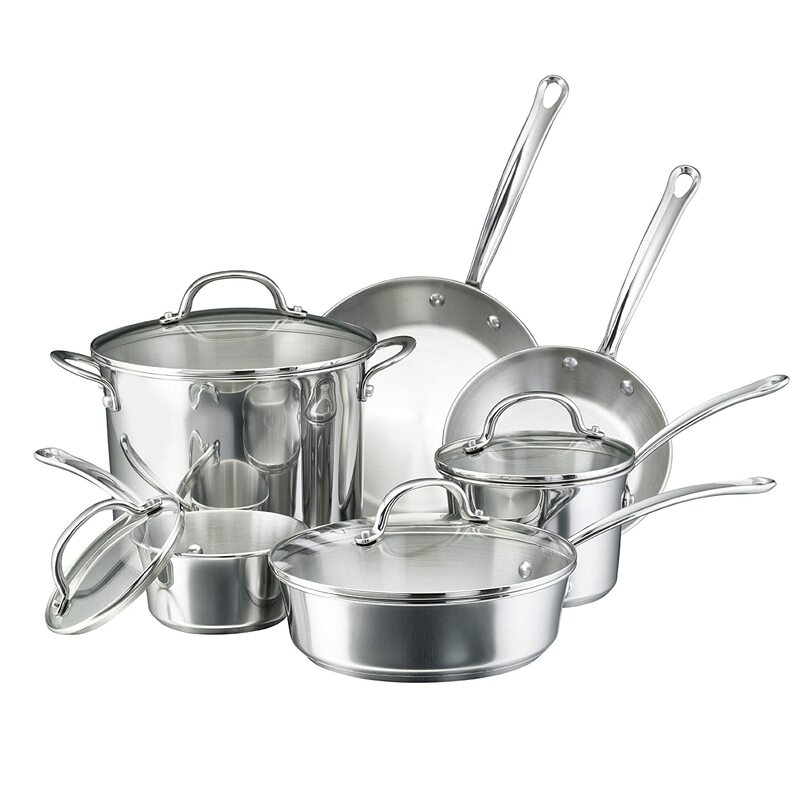 The stainless steel cookware is often sold in sets and it can be considered as one of the kitchen workhorse. It can be durable, easy to maintain, provides fast and unformed heating, dishwasher safe (depending on the material used in handles), and can be compatible for cooktops induction due to its magnetic properties. However, stainless steel pans might be tougher to clean, so opt for non-stick or uncoated pans. So choosing the right stainless steel cookware is important, more on that later. This type of cookware offers convenient operations for sautéing, frying, browning, and searing. This also comes with colorful designs that contribute to the beauty of your kitchen or dining table. Enamelled cast iron pans and cookware may be heavy, comes with small handles, and chip-prone enamel but it provides you a uniformed and well-maintained heating, acid-safe and durable coating, easy cleaning due to its dishwasher-safe materials, and extreme heat and corrosion resistance. This type of cookware is cook’s favorite because of its excellent durability, efficiency and primarily crafted in high-performance cooking. Carbon-steel and blue-steel cookware are ideal for any types of cooktops and perfect for omelet pans and crepe pans. For cleaning, it is advisable to clean it with paper towel mainly because it is not dishwasher-safe and offers only for a single purpose. Aluminium is known for its excellent heat conduction properties and lightweight materials. This type of cookware is affordable however, it might not be great for sauces and light-colored foods primarily because it can discolor and make a bitter taste. Aluminium can be rust-prone, so opt for anodized aluminum coated cookware to avoid any of these side effects. Stainless steel might not be great for heat conduction and known as ‘stick’ cookware, so what’s the point of using stainless steel cookware? Here’s the list of advantages I can think of. Excellent Durability. Stainless steel as mentioned earlier is used for crafting strong weapons, so even when you scratch it, bang it, or scrub it, it still works. It is harder and stronger than copper or aluminum and it can withstand higher melting point without any issues as well, perfect for searing. Non-reactive. Cooking with acidic foods using aluminum or copper cookware may not be a good idea, but with stainless steel, you are sure that it doesn’t react to any food and exploit their results. Effortless cleaning and maintenance. 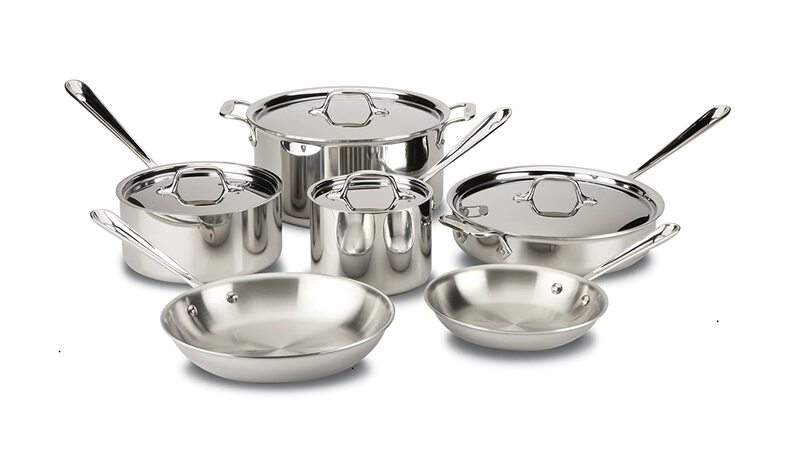 Polished and shiny stainless steel cookware set looks good in the kitchen, plus, it is much easier to clean with the use of vinegar to restore its sparkle and shine. If maintained with care, it will last for like literally forever. Budget-wise and versatile. The real value of the stainless steel cookware lies in its durability. However, some models are affordable but always make sure that it offers excellent durability and versatility. Safe for use. The non-reactive advantages of stainless steel cookware along with its conductivity to other materials and excellent durability definitely contributes to the fact that it is the safest cookware option in the market. To prevent the food to stick on the cookware’s surface cook on medium heat. Soaking hot pan immediately after using will cause warping, so to avoid this, allow your pan to cool down when done cooking before soaking the cookware. Soak the pan with a mixture of warm water and liquid soap. This should allow the food wipe off the surface and clean it immediately. A great tip when your stainless steel cookware shows stains or white deposits is to wash it with water and vinegar, lemon, or salt brine, this will remove effectively remove the stubborn stains and restore its luster and shine as well. It is a good idea to transfer any acidic food to other container or pot, storing food such as tomato-based food in your stainless steel cookware may cause damage. Acids and salts can corrode stainless. A good thing to make your stainless steel cookware non-stick is to heat the pan until it reaches your palm, apply a little bit of oil and let it get hot preferably until it reaches the smoking point, with this, the food should not stick the cookware’s surface. It’s a bad idea to scour the stainless steel pot, if the food has burned, you should cover it with baking soda and allow it to soak for a day or so. Using the non-scratch scouring pad, remove the burned area carefully. The best stainless steel cookware must come with an excellent durability, heat resistant, sturdy, and easy to grip handles. This will allow you to tightly grip the cookware when using and prevents it from slipping when the cooking temperature rises. 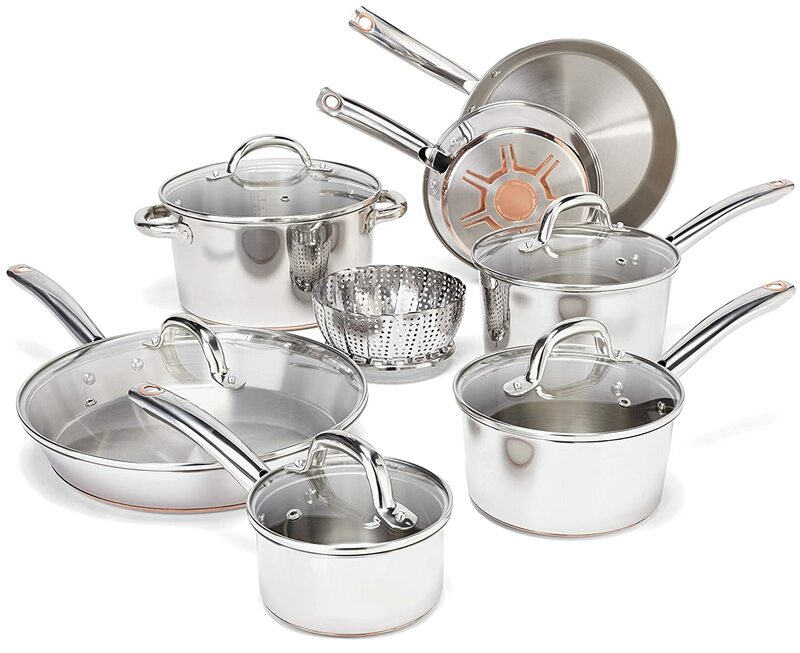 A good stainless steel cookware should also have different size lids that can fit any pots and pans, this is necessary for using other cookware of the same set anytime. Also, opt for venter lids, this will allow the steam to pass through the holes easily. Some manufacturers count the lid, cookbook and other utensils as pieces of a cookware set, so it’s better to opt for assortments of skillets, stockpot, pots, and lids. This is necessary for your cabinet space. Stainless steel cookware doesn’t corrode and it has excellent durability. However, it doesn’t retain heat well and may not be great for uniformed heating. Some models or sets offers an aluminum or copper cores placed on both of the base and sidewall of each pan. This will help you to evenly cook the food and retain its heat as well. Of course, it’s a good idea to opt for dishwasher-safe cookware. Cast iron and copper cookware can be tough to clean but stainless steel can provide you easy and effortless cleaning. 18/10 stainless steel cookware offers a great quality and ensures that the cookware set will be good for long-term use. Chromium is known for its rust resistance properties while nickel gives your cookware a glossy shine. As mentioned earlier, the higher the chromium content, the higher the level of corrosion and rust resistance. Some metals react with certain food, especially for acidic or tomato-based foods. So be cautious with your cookware choices and be aware of the reactivity of each cookware before buying. The price of the cookware will determine the quality of what you’re buying. You may be tempted to buy stainless steel cookware sets that include the most pieces of your money but it’s a smart move to look for the sets that provide you with the pieces that you can really use. The price is only worthy if you really need all those pieces, if no, then think again. 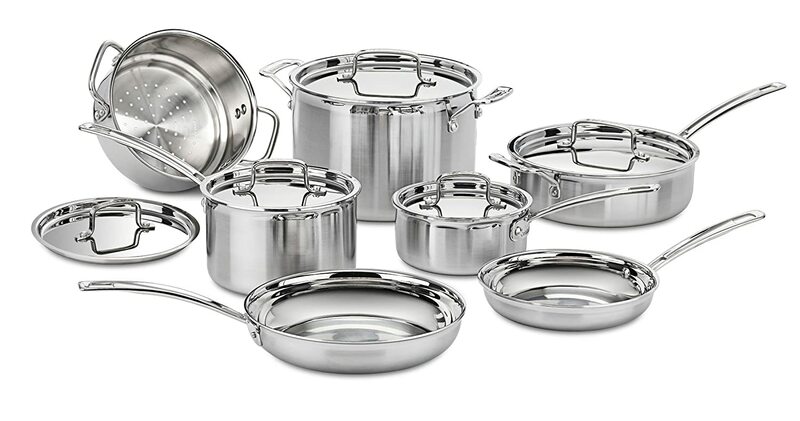 First, on the list is the Cuisinart MultiClad Pro MCP-12N Cookware set, this set provides an 18/10 stainless steel cookware and a great looking brushed finish and mirror polished components that is great for quick release of foods and non-reactive interiors. This 12-piece cookware set comes with an aluminum core for excellent heat conductivity and retention. The 12-piece set has it all, it includes 1-1/2 and 3-quarts of lidded saucepans, 3-1/2 quart sauté pan with lid, 8-quart stockpot with cover, steamer insert with lid and 8 and 10-inch open skillets. The handle is cast with stainless steel great for stovetops, drip-free pouring rims, and stainless steel lids. Above all, this cookware set offers rapid heating, even cooking, and easy cleaning. What more would you want? Excellent performance in less than 2-times of All-clad. Can be used in induction and gas cooktops. ​Stainless steel pot for efficient cooking. 18/10 food grade stainless steel for extreme durability. Oven-safe materials that can withstand up to 550 degrees F.
Uniformed heating and even cooking due to its aluminum core. The pan sides are n’t sloped and it may slip. The lids don’t have holes for steaming. This Stainless steel 13-piece cookware set is great cookware that comes with a copper base instead of aluminum and the base has multiple layers for evenly cooking and rapid heat distribution. The handles are ergonomically designed for secure and comfortable gripping. The lids are glass made perfect for keeping an eye on your cooking process without disturbing it and it also comes with vented lid holes for steaming. The T-for 13-piece cookware includes an 8 and 10.5-inch fry pans, 5-quart covered stew pot, 12-inch lidded fry pan, and 1, 2, and 3-quart sauce pans. This cookware definitely has it all. Ergonomic and stainless steel design handles. Oven-safe materials that can withstand up to 500 degrees F.
The multi-layer base for even heat distribution. Uniformed heating and even cooking due to its copper core. The cookware set is not non-stick. If you need several different pieces of cookware and you have a bit more money to spend then this cookware set might be your great option. The Chef’s Star professional stainless steel 17-piece cookware set is built to last, thanks to its 18/8 commercial grade stainless steel materials and aluminum core for even distribution of heat. Ergonomically designed handles for non-slip. The 17-piece cookware set includes 1.6 and 2.5 quart sauce lidded sauce pans, 8 and 10 inch frying pans, 8.6 quart stock pot with cover, 5.5 quart sauté pan with helper and cover, 4.2 quart casserole, 3 piece kitchen utensils such as a spoon, 2-prong fork, and slotted spatula, and steamer and boiler basket. The cleaning is easy because it is oven-safe and dishwasher-safe. The cookware set offers a limited warranty but if you love to cook delicious recipes, this cookware set is the best choice for you. Ergonomic designed and non-slip handles. Can be used in different cooktops. 18/8 food grade stainless steel for extreme durability. Uniformed heating and even cooking due to its aluminum core base. The lids are not vented for steaming. If you’re looking for an all-purpose cookware with quality performance then this cookware might be a good option for you. The 10-piece cookware set includes 8-quart stockpot with cover, 3 quarts sauté pan with cover, 10-inch fry pans, and 2 and 3-quart saucepans with lids. For even cooking and uniformed heat distribution, the set offers an aluminum core. Both the interiors and exteriors are stick resistance for easy maintenance, plus it components is non-reactive to certain types of food. Oven-safe and broiler-safe materials that can withstand up to 600 degrees F.
A non-stick surface and easy maintenance and non-reactant to certain foods. The Farberware Millennium Stainless steel 10-piece cookware set is perfect if you’re on a budget and don’t cook very often. This cookware set has been highly recommended for its budget-wise but quality performance. It offers a non-stick surface that allow you to cook any food at ease. The base also provides an even heating and the handles are designed for secure and safe gripping. The set includes 8-quart lidded stockpot, 3-covered sauté pan, 1 quart and 2 quarts covered saucepans and 8 inches and 10-inch glass lidded skillet. The Farberware cookware set is probably one of the best stainless steel cookware with affordable price. Ergonomic and stainless steel designed handles. 18/0 food grade stainless steel. Oven-safe and broiler-safe materials that can withstand up to 500 degrees F.
So which one do you think is the best? All the stainless steel cookware sets listed above offers excellent durability, gorgeous looking, and definitely cooking in them is a pleasure every day. 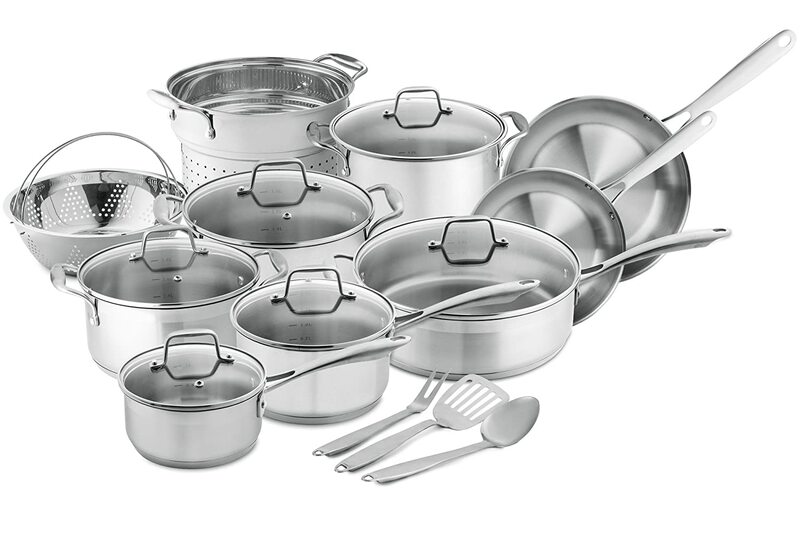 Our best pick would be the Chef’s Star Professional Stainless Steel 17-piece cookware set, here’s why. The Chef’s Star Professional Stainless Steel 17-piece cookware set has all the essential and convenient pans, pots, and kitchen utensils. The cookware also offers compatibility on any cooktops such as electric, gas, infrared, glass, ceramic, and induction stoves. The handles are ergonomically designed for comfort. The durability is superb thanks to its 18/8 food-grade stainless steel that comes at a reasonable price plus backed with a lifetime warranty. This cookware set will last forever if taken care and maintained properly. I hope this buyer’s guide and review can help you with your purchasing decision. What’s your favorite pick? Let us know by commenting below and share this article with your friends and family as well to help them with their purchasing decision this coming holiday.